An 18th Birthday cake made from Victoria sponge and iced with buttercream. 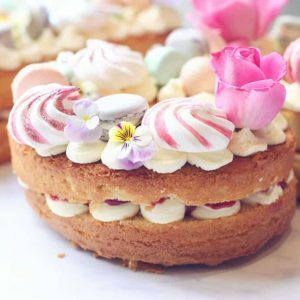 The cake has a pastel colour scheme and is decorated with macarons in four colours, handpainted sparkly meringues, Lindt strawberry chocolates and roses. How am I making an 18th birthday cake already? They say the days are long but the years are short and isn’t that the truth! I recall exactly what it felt like to hold my baby daughter, Holly, in my arms and here we are BAM 18 years later and a whole heap of long days and short years. 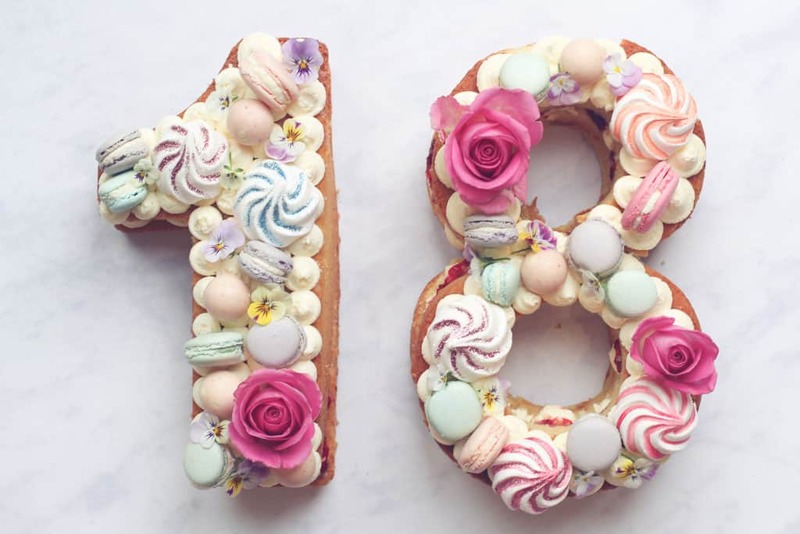 Turning 18 is such a momentous event and I wanted to give Holly a beautiful cake that she would remember, it also had to be big enough to feed plenty of people. 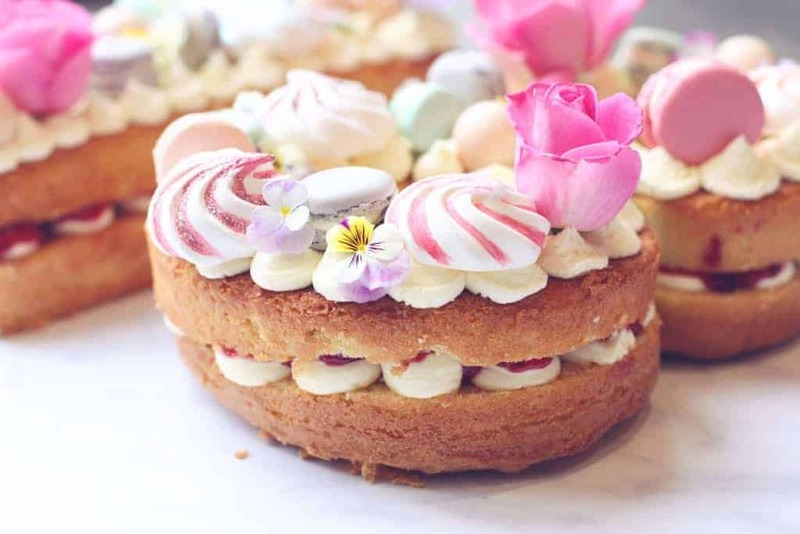 I decided on a number cake having lusted after them on Pinterest and marvelling at how pretty they are. I settled on a traditional Victoria sponge with a vanilla buttercream icing. I went with a pastel theme baking macarons in four colours and plain meringues that I hand painted with food colouring, adding a touch of glitter for that 18th birthday cake sparkle befitting of a special girl. Now, I’m not going to lie. This 18th birthday cake was a challenge. 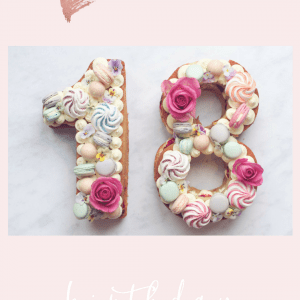 The sheer size of it felt an enormous task and of course, the pressure was on to make it look as perfect as possible when presented to Holly’s at her 18th birthday party. All three of my children have birthdays within the same one month period and I make a cake for each of them so that did add to the stress a bit too. Plus, I made macarons for the first time ever to decorate the cake with. In FOUR different colours. Yeah, I know. So if you’re not an accomplished macaron maker save yourself a whole lot of hassle and buy a box of them instead of baking them from scratch. 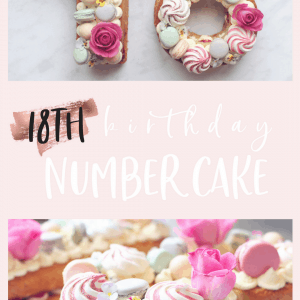 Making them was fun and I’ll definitely attempt them again (just not at the same time as baking an 18th birthday cake or any cake for that matter!). Oh, and the fact I took the number 8 out of the oven and dropped it on the kitchen floor didn’t help either. SPLAT. I could have cried! Despite the fact I had to bake part of the cake twice it turned out great, I was really proud of it and Holly loved it so all’s well that ends well. I got my silicone baking trays from Amazon, they were brilliant and the numbers held their shape really well. You can easily resell them separately once you’re done too! 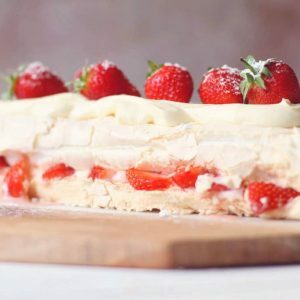 Does Buttercream Need To Be Refrigerated? Buttercream icing does NOT need to be refrigerated. It’s stable due to the amount of icing sugar used and will keep for 2-3 days. 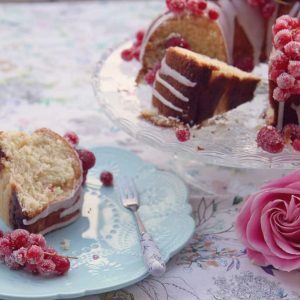 You really don’t need to worry about cramming a huge iced cake into your fridge! Just cover it will some clingfilm and leave it somewhere cool. I found a really easy to follow macaron recipe here. To make the meringues I used Delia’s recipe, which I’ve used many times and is absolutely foolproof. I mixed a tiny drop of this gel food colouring with water and painted the meringues then added this edible glitter for extra sparkle. An 18th Birthday number cake made from Victoria sponge and iced with buttercream. The cake has a pastel colour scheme and is decorated with macarons in four colours, handpainted sparkly meringues, Lindt strawberry chocolates and roses. Heat oven to 190C/fan 170C/gas 5. Prepare the silicone moulds by lightly spraying them with vegetable oil and put them on a baking tray for stability. 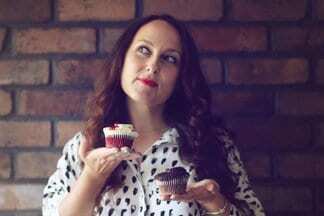 You will be making 4 cakes in two stages, ready to be sandwiched together later. Add 400g caster sugar and 400g butter to a mixing bowl and beat until creamy. Add 4 eggs and 4 tbsps of milk and beat until you have a smooth batter. Into the bowl, sieve 400g self-raising flour, 2 tsps baking powder and fold everything together. Don't overmix or you'll knock the air out and end up with flat cakes. Divide the mixture between the two number moulds. Use a spoon to ensure the cake mix is right to the edges of the number and then smooth the top. It doesn't have to be perfect as you'll trim it once it's baked. Once baked, leave on a wire rack to completely cool before you attempt to turn them out. When your first two cakes are cooled and removed from the moulds repeat steps 3-7. Trim the tops of the cakes with a serrated knife. You can freeze them at this point or wrap them in greaseproof paper until it's time to decorate. Beat the butter until creamy then beat in the icing sugar a couple of tablespoons at a time. Beat in the vanilla extract then check the consistency. If it's too thin add more icing sugar if it's too thick add a little milk. Fill a piping bag fitted with a large round nozzle with the buttercream. Pipe large round circles on top of the jam on each cake. Sandwich the other cakes on top. Pipe large round circles of buttercream all over the top of each of the cakes. Decorate with macarons, meringues, lindt chocolates and roses. 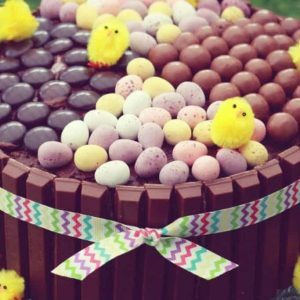 Looking for more showstopper cake ideas? 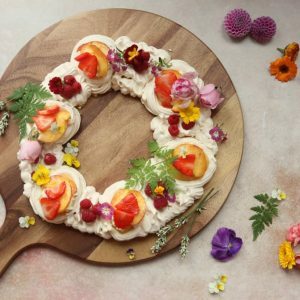 I think you’ll love this easy meringue wreath with lemon curd and edible flowers. I really hope you found my 18th birthday cake recipe helpful. If you made this, let me know. Leave a comment, rate it, and don’t forget to tag me @amytreasureblog on Instagram so I can see it!